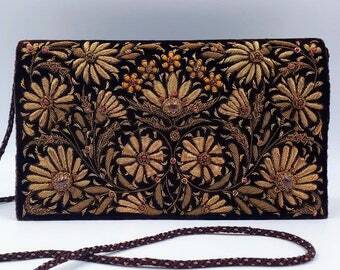 Exquisite embroidered purses, shawls, jewelry. INDIA! Announcement WELCOME to BoutiqueByMaryam! Discover the rich colors and designs of India! Feel the romance and adventure of an exotic land! 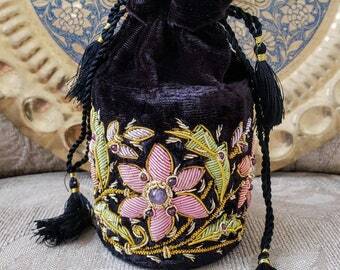 Find exquisite embroidered accessories, statement pieces, unique treasures of uncommon beauty and workmanship, meticulously hand crafted by artisans using techniques handed down over generations. 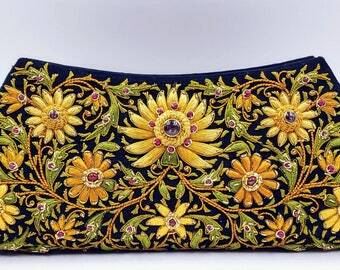 Join us in reviving the royal art of Zardozi embroidery, or "writing with gold" - embroidery using metallic threads and semi-precious stones to create a rich, luxurious and unique 3D effect. Our designs are inspired by centuries of tradition and culture. 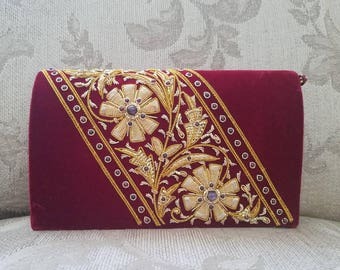 We also welcome your custom designs. The artisans thank you for your part in preserving their legacy and in advancing their craft. Namaste. WELCOME to BoutiqueByMaryam! Discover the rich colors and designs of India! Pretty! The quickest shipping on Etsy award goes to this shop!! My item was purchased as a gift. I was very pleased with the quality and workmanship. It was received way in advance for my sharing with a special party. 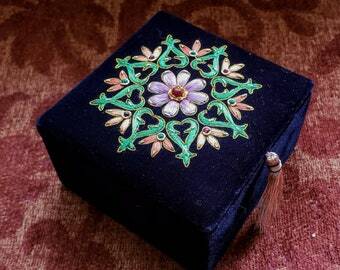 Hand embroidered keepsake boxes, accented with genuine gemstones. Perfect for a special gift! Summer fun! Show off your tanned arms with these colorful beaded bracelets! Get ready for summer! 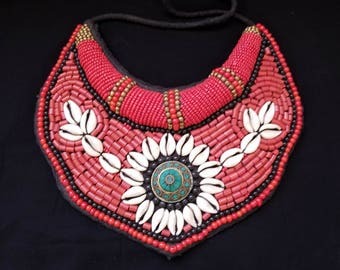 Great selection of TIbetan collar and bib necklaces in all sizes and shapes! Matching bracelets! Vibrant colors! Inspiration is everywhere! Design inspiration...Peacock doorway in Jaipur. 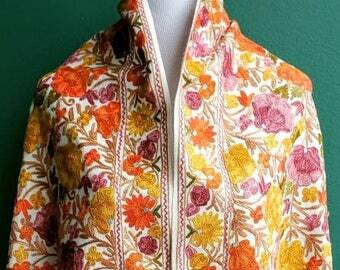 I am inspired by the colors and the craftsmanship of India! India is color! Color is everywhere - in the food, the dress, the architecture! The earthy colors of spices - turmeric, saffron,mustard, curry, cinnamon; vibrant reds and oranges of fruits - persimmon, mango, pomegranate; intense blues and purples of the sky and the ocean; the iridescent greens of the peacock and the parrots. And the ever present pink! 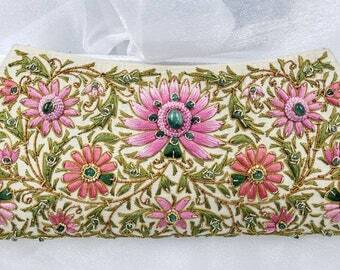 India is adornment! Even those living under the simplest or most difficult conditions value and seek beauty in their lives. They find or create something beautiful, which they wear and cherish. 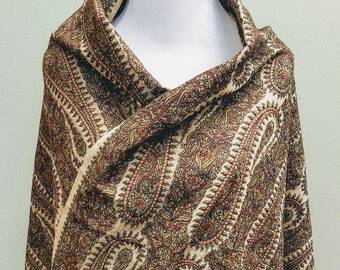 India is skilled craftsmen and women, often going back tens of generations. Creating works of astonishing detail, creativity and exquisite beauty that require infinite patience - often taking weeks, months or years to finish a particular piece. I simply fell in love. I wish to share with you this discovery and to encourage and support these craftsmen and women in their traditional crafts. When you purchase an item from my shop, you play a part in preserving their legacy and advancing their craft. Know that you receive the blessings of the families that made that item. Namaste.